Transport for Greater Manchester (TfGM) has worked with Dinosaur on a summer campaign designed to boost off-peak travel on the Metrolink. Via a series of outdoor posters, supported by organic and promoted social activity, members of the public are encouraged to Catch the Summer. To take part, they post their favourite photos from their summer days and nights out on Instagram, and tag them with #catchthesummer. In return, they could win a variety of prizes or have their shot featured on a posters across Manchester. The photo-based campaign represents new social territory for the transport company, which has launched its @officialtfgm Instagram account with this campaign. 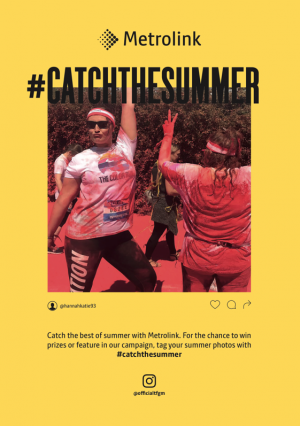 Running until late August, the Catch the Summer campaign showcases a variety of events across the region and inspires users to share individual moments. Organic activity is supported by promoted activity managed by media agency, Carat, to boost engagement, awareness and conversion.